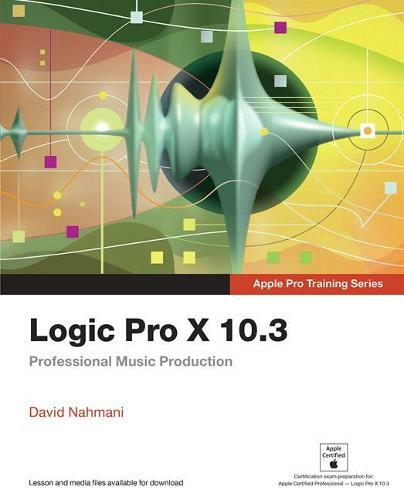 Record, arrange, mix, produce, and polish your music with this bestselling, Apple-certified guide to Logic Pro X 10.3. Veteran producer and composer David Nahmani uses step-by-step, project-based instructions and straightforward explanations to teach everything from basic music creation to sophisticated production techniques. Using the book's downloadable lesson files and Logic Pro X, you'll begin making music in the first lesson. From there, you'll learn to record audio and MIDI, create and edit sequences, and master mixing and automation techniques such as submixing with Track Stacks or the practical uses of true stereo panning. You will create both acoustic and electronic virtual drum performances using Drummer tracks with Drum Kit Designer and Drum Machine Designer. You'll use Logic Pro X MIDI plug-ins and Smart Controls to control software synthesizers from a MIDI controller or an iPad. Flex Time will allow you to precisely edit the timing of notes inside an audio recording, and you'll explore Flex Pitch to correct the pitch of a vocal recording. Finally, you'll mix, automate, and master the song, using plug-ins to process only selected sections or entire tracks, giving your audio creations the final polish needed to achieve a professional sound. Downloadable lesson and media files allow you to perform the hands-on exercises. Focused lessons take you step by step through practical, real-world tasks. Ample illustrations help you master techniques fast. Lesson goals and time estimates help you plan your time. Chapter review questions help you prepare for the Logic Pro X 10.3 certification exam. The Apple Pro Training Series is both a self-paced learning tool and the official curriculum of the Apple Training and Certification program. Upon completing the course material in this guide, you can become Apple Certified by passing the Logic Pro X 10.3 certification exam at an Apple Authorized Training Provider. To find an Apple Authorized Training Provider near you, please visit training.apple.com.